If you are wondering by a book store of news stand be sure to pick up a copy of the Winter 2013 edition of Fly Rod and Reel magazine. The magazines editor Greg Thomas along with their photographer Geoff Moore were our guests at both our lodges last September. In the article Gregg tells the story about his fishing and adventure. The article is called " Quebec Salmon" I'm sure you'll find it interesting and enjoyable. Greg with his first Bonaventure Salmon! 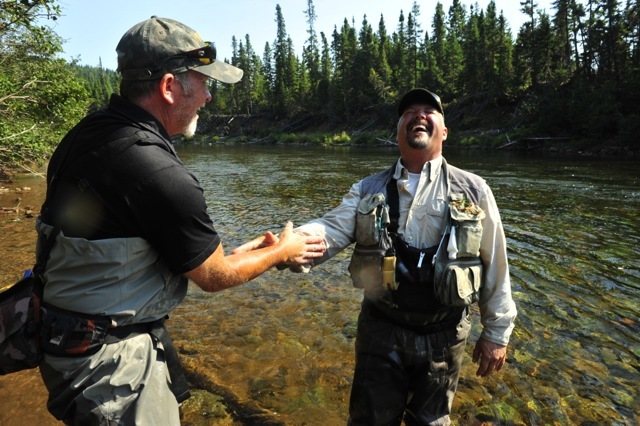 Greg Thomas celebrates his first Grand Cascapedia salmon with Salmon Lodge guide Yvan Bernard.